Lego has unveiled a new robotics system that teaches kids computer science skills at the annual International Consumer Electronics Show (CES) taking place this week in Las Vegas. The company’s Mindstorms platform for teens has been around since the 90s, but the new Lego Boost kit is designed for kids aged 7 or older. 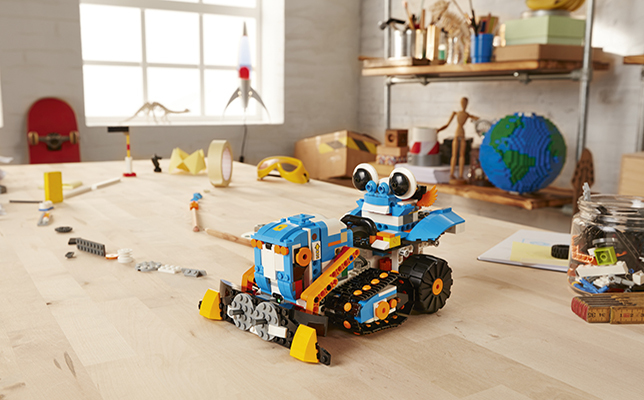 The Boost kit is a creative toolbox that includes five models in each set: a standard robot (called “Vernie the Robot”); a robotics cat (“Frankie the Cat”); a builder (“the Autobuilder”); a multi-purpose vehicle (“Multi-Tooled Rover 4”); and a guitar (“Guitar 4000”). To build these models, students can use the companion mobile app that allows them to program various behaviors for the robot. Intuitive software that features an icon-based, drag-and-drop coding interface. Lego Boost will available in August 2017 and priced at about $160. To learn more, watch the video below or visit the Lego site here.